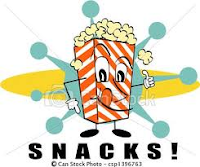 Carole's Chatter: Food on Friday: Snacks & Treats – a day late but not a dollar short! Food on Friday: Snacks & Treats – a day late but not a dollar short! We've done Snacks & Treats before. But another round is in order. Anything you make as a snack or treat will fit the collection. To add your snacks/treats, just put the name of the dish together with your blog name/name into the first Mr Linky box you will find below. Then paste the url for your post about it into the second box. Thanks for hosting. :) Have a great weekend! Carole, thanks for hosting. I'm going to check out those dips and spreads. Enjoy your weekend! We want snacks everyday don't we? LOL! Snacks and treats are what makes me happy! When we go out to eat, I always want to make a meal of the appetizer menu. Too many good choices.